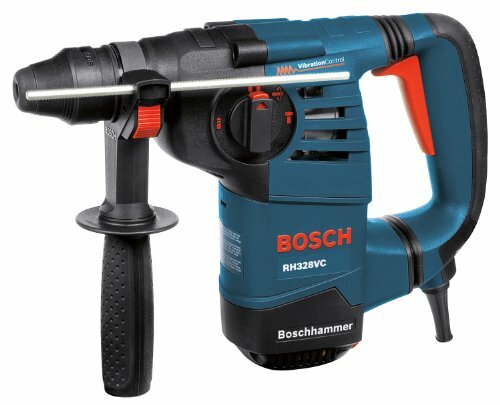 Bosch 1-1/8-Inch SDS Rotary Hammer RH328VC with Vibration Control by Bosch at N Online Agency. MPN: RH328VC. Hurry! Limited time offer. Offer valid only while supplies last. POWER: Unmatched power to weight ratio - 8.0 Amps, 2.6 ft-lbs Impact Energy and 7.7 lbs -Compact but powerful, making the RH328VC the ideal rotary hammer for all-day jobs. COMFORT: Featuring Active Vibration Control in the hammer mechanism and the grip area provides maximum user comfort for fast drilling during extended periods of work. 3-in-1: Multifunction selector offers 3 modes of operation; rotation only, rotary hammer and hammer only mode for any tough drilling job. Bosch-exclusive Vario-Lock places the tool in neutral, allowing you to choose from 12 different positions. PRECISION: The integral clutch helps minimize torque reaction and a 360-degree auxiliary handle gives the rotary hammer better flexibility for any task.